As you may or may not know, Taylor’s Birthday is on the 4th of July. Every year, I try to select a cake that is really special and normally, pretty over the top. Amongst the array of dessert items that are available on the 4th, I like to be sure Taylor’s cake is separate from those. This year, I had planned on ordering Chocolate Covered Frozen Key Lime Pie on a Stick. For months. At least 4 months prior to his birthday, this was my plan. My plan was also to be in Cincinnati for his birthday. Well, when our vacation plans changed last-minute, and we were to be in Blairsville instead, my entire cake plans had to change too. Besides the shipping issue, I also had the issue of having far too many Key Lime pieces. So, I thought and thought and finally realized what it would be. In the recent months, Taylor has been loving the Starbucks Cake Pops. Bingo, I would find someone to make some Cake Pops. After a bit of research with my friend Google, I found Melissa’s Custom Cakes & Goodies located in good ol BVille. I got in contact with Melissa and found that she could indeed make Cake Pops – score – along with a variety of other items. Plus, she said sky’s the limit as far as flavors & fillings go. I knew right off the bat, this was a match made in heaven. Of course, I planned on having cake pops but then also decided to do some cupcakes. My final order consisted of 4 Vanilla Cake Pops, 4 Chocolate Cake Pops and 4 Key Lime Cupcakes. I was pumped up and excited and could not wait to arrive. Not only did Melissa prepare these items for me on a Holiday, she was also able to deliver them to me – on the 4th of July. Talk about some good service. While half of the town was closed, I was able to get my cake delivery. I realize now that I did not take a picture of my entire order – don’t ask me how that happened. Everything looked lovely. 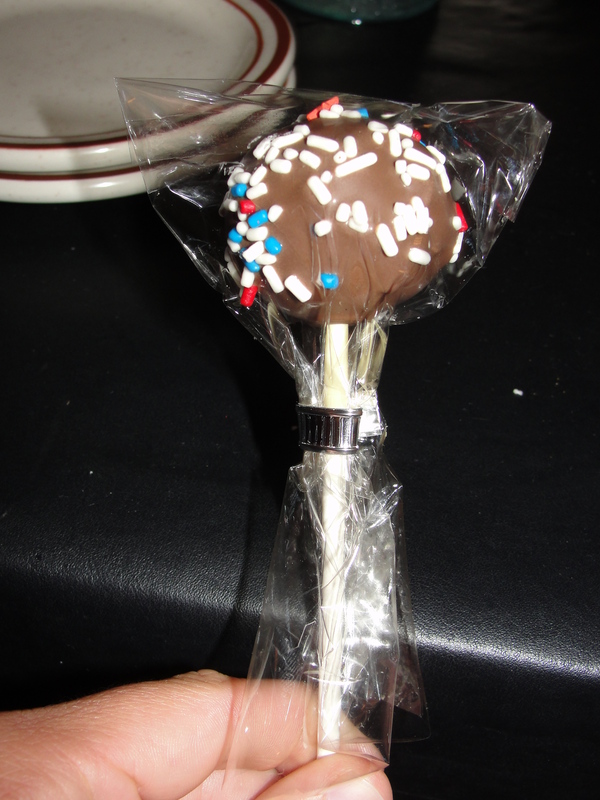 The cake pops were individually wrapped in cellophane and each one was covered with chocolate and Patriotic Sprinkles. Also, the cupcakes were perfectly frosted and adorned with the needed Patriotic Sprinkles as well. We brought these items with us to dinner and I was ohh so excited to dig into them. Let’s begin with the Key Lime Cupcakes. I did not have an entire cupcake yet, I did have a bite. The frosting was amazing and clearly was homemade. This provided the frosting to be the perfect consistency along with the perfect flavor – none of that fake HFCS here. As for the cupcake itself, the cake was very moist and filled with a key lime custard. Wow…one bite of the custard, cake and frosting was dynamite. All of the flavors played equal parts and nothing was overpowering – a good thing since key lime is normally the winner. The cupcake was flavored with just enough of all the right things to make me appreciate the key lime flavor but, be neither over or underwhelmed with it. Overall, quite tasty. All 4 cupcakes were gone in no time. I didn’t actually try the Vanilla Cake Pop until the day after the 4th, but, it was still delicious. While the interior was vanilla cake, the exterior was coated in chocolate. I found the interior to be very ‘doughy’ even though it was fully cooked. This is exactly how the Starbucks cake pops are. I’m not a huge fan but, was impressed with how closely Melissa matched her cake pop to the Starbucks pop. Especially since this is exactly what I asked her to do. Even though I wasn’t a huge fan of this, it was still quite tasty. By far, the winning object for me, was the chocolate cake pop. One bite into this thing and I felt like I died and gone to heaven. The Patriotic Sprinkles were just an added bonus to the cake pop – they really didn’t provide any flavor. However, the exterior coating of chocolate? Wow. The coating was hard enough to coat the cake pop but, perfectly smooth and melt-in-your-mouth as soon as you bit into it. The flavor reminded me of a Hersey’s Milk Chocolate Bar and I found myself in love with the coating right away. I loved how smooth the chocolate was and how the flavor was just right. As for the interior of the cake pop…it was beyond moist. It was the supreme being of moist. It was Simply, Perfectly Moist. The cake was not only moist but, was also was amazing in flavor. Simply sweet & just the right amount of chocolate, made this cake delicious. Taylor enjoyed all of his birthday treats and I am so glad I found Melissa. I would highly recommend Melissa’s Custom Cakes & Goodies for any of your bakery needs in the Blairsville Area. These cake pops & cupcakes, were delicious. Plus, the items were extremely reasonably priced. I so wish I had ordered more of these cake pops – thinking about them now has me missing them and wishing I had their Simply, Perfectly Moist selves all to myself right now. 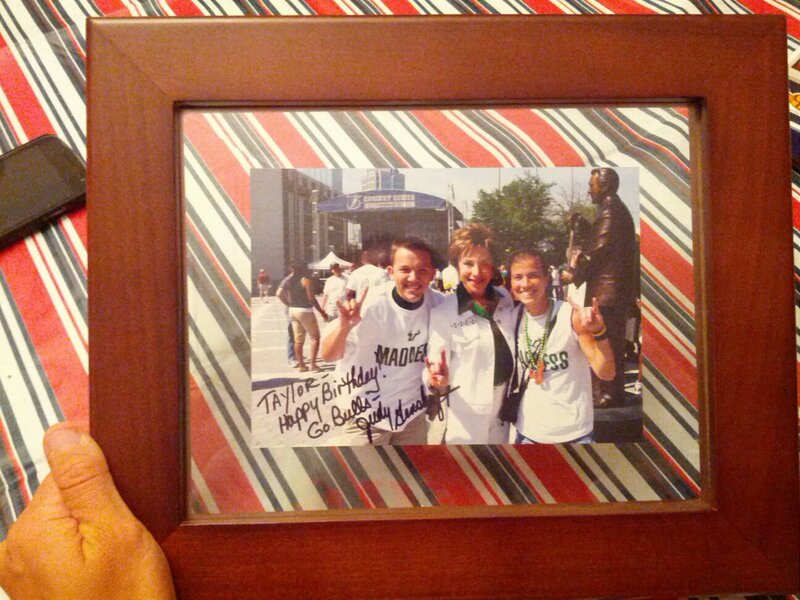 As a bonus, one of Taylor’s Birthday gifts…I got the picture of us with our USF Idol Judy, personalized for Taylor. Yes, I know, you wish to nominate me for Sister of the Year. Happy Birthday to Taylor and Happy Birthday America.